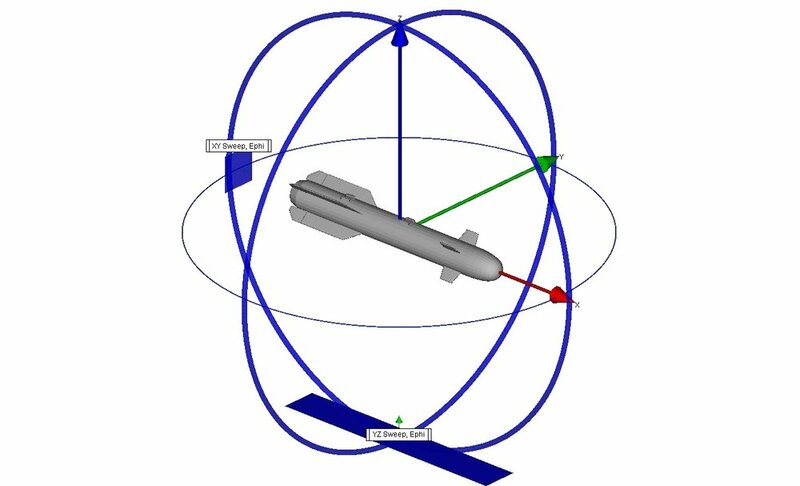 XGtd® is a ray-based electromagnetic analysis tool for assessing the effects of a vehicle or vessel on antenna radiation, predicting coupling between antennas, and predicting radar cross section (RCS). It is ideally suited for applications with higher frequencies or very large platforms where the requirements of a full physics method may exceed available computational resources. X3D RCS Model is a GPU-accelerated, multi-threaded 3D propagation model providing highly optimized calculations for far zone radar cross section (RCS) analysis, using methods based on Physical Optics (PO), the Method of Equivalent Currents (MEC), and the Uniform Theory of Diffraction (UTD). X3D’s exact path and targeted ray shooting algorithms provide higher accuracy than traditional ray tracing models that are based on the shooting-and-bouncing ray (SBR) method. The model can support frequencies up to millimeter waves. co-site interference analysis, anechoic chamber analysis, or far zone antenna radiation from a platform-mounted antenna. It also provides an alternative method for predicting far zone RCS. Graphical User Interface XGtd's modular 64-bit GUI makes it easy to import objects to set up projects for various electrical large platforms. Users can simulate co-site analysis, antenna placement, radar cross section, and anechoic chambers. Feature Import Support for KMZ, COLLADA, STL and DXF formats for object import. Large Platform Simulations XGtd’s methods are less impacted by the platform’s electrical size than full wave techniques, supporting larger structures and higher frequencies. Ray Path Visualization Display ray paths for far zone antenna gain, RCS calculations, or antenna coupling. Rays are colored according to strength, allowing users to identify scattering features. XFdtd Compatibility for Higher Fidelity Antenna Patterns Calculate antenna radiation patterns for complex antenna designs using XFdtd. Import into XGtd to determine effects of placement on electrically-large platforms. Antennas Import simulated antennas from XFdtd or create textbook antennas for use as transmitters and receivers. Materials Electrical properties of the scene can be defined down to the facet level. An installed database of materials includes metal and absorbers. Outputs Users have quick access to outputs such as direction-of-arrival, complex impulse response, E-field vs. time, and E-field vs. frequency for each transmitter-receiver link. These ASCII-based files can be plotted in the tool or easily post-processed externally. S-parameters are exported to touchstone. A comparison of XGtd and FDTD calculated antenna gain for a half-wave dipole inside a corner reflector. This example considers the far zone antenna gain patterns from a 0.125 m monopole antenna situated on top of a metal box. Successful integration of an antenna onto a vehicle platform poses many challenges. This paper provides a variety of examples of how modeling and simulation can be used to analyze antenna performance, identify problems, and evaluate potential solutions. This paper presents the major components of the “Virtual BAF” simulation model as well as a few examples of its use in preliminary test design and setup.